Sharp MX-6580N | The Miller Company, Inc. 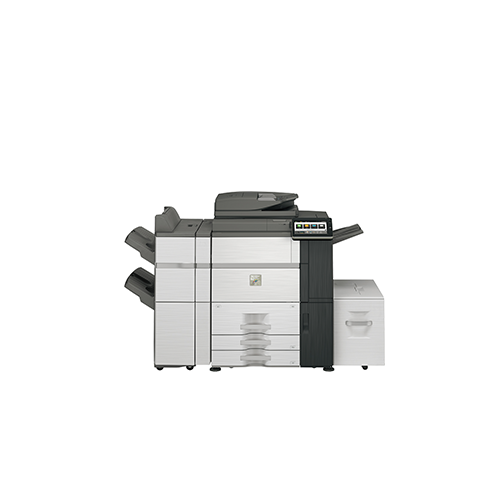 The MX-6580N/7580N encompass brilliant, consistent color quality with advanced workflow capabilities. Inspired by the latest application and imaging technologies, these new models offer a rugged design and a user friendly experience, helping customers navigate document workflow with unmatched efficiency. Built for high-volume office environments, central reprographics departments and copy rooms, these new document systems are complemented by the robust paper handling and productive output capabilities once found only in commercial print facilities. Sharp’s next generation Color Consistency System helps ensure brilliant color output, page-after-page and job-after-job for repeatable, high-quality results. Businesses can rest assured that producing professional-looking color documents in house can be easier and more economical than ever before.